Whilst most pupils enrol at the school during the main admissions round, it is not unusual for school places to become available in all year groups, for example when families move out of the area. If you are keen for your child to join Cams Hill School, please contact our Admissions Secretary who will be able to advise on your next steps. Please read the information below in conjunction with the information provided on our ‘Admissions’ page. The transition from primary to secondary school is a significant milestone in the lives of children and their families. At Cams Hill School we aim to provide our pupils, parents and carers with a smooth and personalised transition and settling-in programme so that pupils arrive on their first day in September feeling ready and excited to join our wonderful school community. We aim to provide pupils with a rich and vibrant learning experience through our curriculum and other activities, with many opportunities and challenges, to help them to develop into confident, well-qualified individuals, ready for the next steps in their education, future training and employment. The transition programme is supported by the relationship we have with very many local primary schools. To maximise potential, primary and secondary school teachers work together to develop a curriculum that prepares pupils for future learning and builds on previous learning. 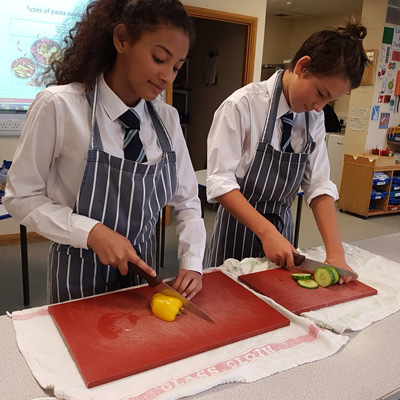 Cross-phase activities take place during the year with both primary and secondary school pupils enjoying the benefits of working together and for primary pupils to experience the secondary school environment. 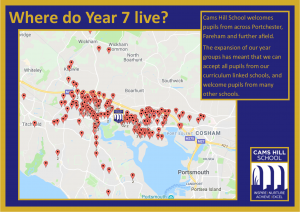 In the Spring Term, the Year 7 team make visits to primary schools to speak with the Year 6 teachers about every pupil offered a place at Cams Hill School and also with the pupils to answer their questions and to describe life at Cams Hill. A welcome pack is sent to parents/carers once the offer of a place has been accepted; this contains a raft of information about the school’s routines and procedures, key dates, as well as information about the transition programme. Key Stage 2 SATs results are used to help inform teachers about the prior attainment and ability of pupils. We also gather from conversations with primary school teachers regarding aptitudes for subjects, strengths and areas for development, interventions that have helped pupils to learn and teachers’ judgements of pupils’ overall ability. It is usual for some pupils to need more support. Our ‘Enhanced Transition’ programme. This involves one-to-one work and small-group visits to Cams Hill before the major transition events for all pupils. Our SENCo makes contact with the SENCos at the primary schools to ensure that pupils with SEN have the support they need, and that important information is handed over. The Year 7 team offer ‘clinics’ at Cams Hill in the Summer Term for parents/carers to talk through any concerns or issues they may have. Pupils are placed into mixed ability tutor groups using all the information given to us by primary school teachers; this will include information regarding issues which may exist (past and present) between pupils and need to be considered. We are not able to take into account ‘best friends’ and cannot guarantee that pupils will be placed in a group with their closest friends. Tutor groups C, A, M and S study French while H, I, L1 and L2 study Spanish. Parents and carers are invited to express a preference for one of these languages and we try to accommodate this preference when determining tutor groups wherever possible. Your child will be invited to join us on two transition days in July where they will have the opportunity to meet the rest of their tutor group, make new friends, attend new and exciting lessons and meet members of staff and pupils. It is the case that the children feel much more confident and reassured about the move to secondary school after their ‘Transition Days’ have taken place and eager to return! At first I was scared but everyone was very welcoming to me. As no one came from my primary the transition days helped me to meet new people. I managed to meet a boy to get the bus with and this really helped me feel less worried about how I was going to get to school. I also liked how I got to meet my tutor. We were taught lots of mini lessons and it gave us a taste of what secondary school was like. It was scary at first but also very exciting. The teachers were really friendly in all our lessons and helping us get around the building. This made me feel more relaxed about coming up in September. The pupil buddies were also really kind to us and looked after us very well. I really enjoyed the lessons on induction day, especially English. We got to look at some very hard but exciting texts in English and this really helped my creative writing. I also liked finding out about all the clubs I can join when I come here in September. The transition days were really exciting because we got to do fun experiments in Science and I also made new friends from different schools in my tutor group. Moving round to the different lessons was a bit stressful but the buddies helped us get to the different rooms. The buddies were kind and also answered lots of our questions. We run a popular and affordable fun-filled Activities Week during the summer holidays for Year 6 pupils who are going to start at Cams Hill in September; this week of sports and other activities is delivered by Cams Hill School staff and helps pupils to familiarise with the school site, grow in confidence and make new friends before the beginning of the school year. I really enjoyed activities week as we got to do outside activities and play lots of team sports. We also go to go inside and see more of the school. It helped me make new friends who were in my tutor which made me less scared about coming in September. I also liked getting to know some of the teachers. When pupils arrive in Year 7, they are nurtured by the Year 7 team, their tutors and the brilliant Year 9 pupil buddies, who will mentor and support them whilst they find their feet. In October, parents and carers are invited into school to meet with their child’s tutor and discuss how they have settled-in to the school. Please do look at the rest of our website which provides you with lots of information about our school. Should you have any questions then please do not hesitate to contact our transition team – Miss S Haynes (Head of Year 7), Mrs J Braisher (Assistant Head of Year 7), Miss L Hatt (Transition Project Shadow) Miss S Jenns (Admissions Secretary) and Mr A Haines (SENCo). 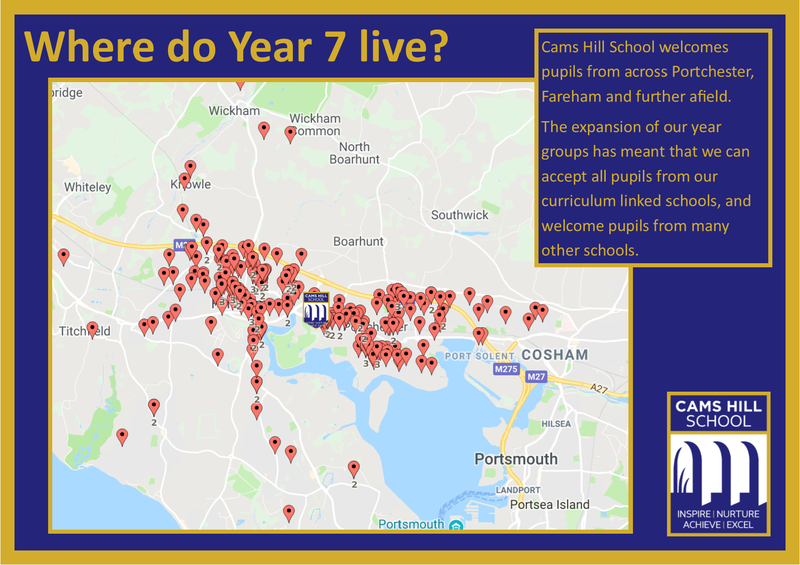 Thank you for taking the time to look at our Transition information and we look forward to meeting you and your child when you arrive with us at Cams Hill School. Please ring 01329 231641 to arrange a visits. Parents and carers will be advised of the place allocated to their child. Any queries please contact Hampshire County Council Admission Team. 1 March 2019 Data received by Cams Hill School of those pupils who have been allocated a place from September 2019. End of April 2019 ‘Welcome pack’ sent to parents and carers. This letter will detail the up and coming transition events that will take place before your child joins us in September 2019. All pupils will be invited to attend a day of new and exciting lessons and a chance to make new friends with those other pupils joining us in September 2019.